Learn how to solve a system of equations graphically by plotting points and finding the point(s) of an intersection. There are two ways to find the point where your lines intersect. The slope is another way of measuring rise over run or the ratio of distances from each point on the line. Start plotting points from each line’s y-intercept, and then plot the point from there using the slope of the line. When you do this for each line, you get a point of intersection where the coordinates of that point are identical on both lines. Another way to find the point of intersection is by making a table for the x and y values, and finding the coordinates by plugging each x value into the line equation for both lines. So now you find the two identical coordinates from the two tables, and that coordinate would be your point of intersection. 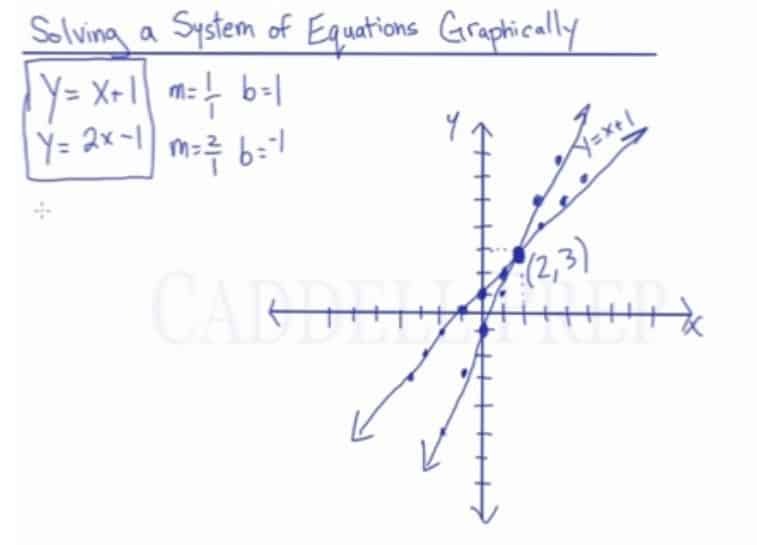 In this lesson, we will discuss how to solve a system of equations graphically. A system of equations is two or more equations. And to solve it, we have to have the value of and . In order to do that, we have to work on the two given equations. Remember, not just one but both of the equations at the same time. We’re going to solve the system of equation by using the graph. We will plot the points of the given equations. We will graph them and find the intersection of these two equations. The intersection of the two equations represents the and values. Just a review, the formula for slope is and -intercept. Let’s graph this by starting at or our -intercept. Then we move to the right by point and go up by point. Then we move to the left by point and go down by point. Then draw a line segment. So let’s start at -intercept which is . Then let’s go to the right by point and go up by points. Then let’s move to the left point and go down by points. Here, we can see that the two lines intersect at coordinates. Aside from graphing, we can also use a table.